China's former drug and food safety watchdog chief was executed on Tuesday after being found guilty of corruption and dereliction of duty, Xinhua news agency said. Zheng Xiaoyu (centre), head of China's State Food and Drug Administration from 1998 to 2005, reacts to his death sentence at the Supreme People's Court in Beijing. 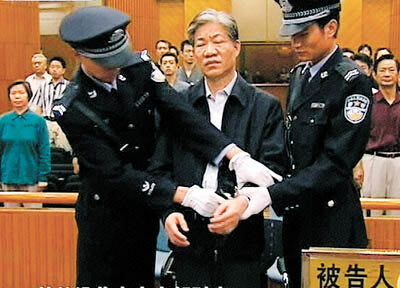 Zheng, head of the State Food and Drug Administration from 1998 to 2005, was sentenced on May 29 and his appeal was heard last month. Zheng's execution marks the first time China has imposed a death sentence on an official of his rank since 2000. The harsh sentence reflected Beijing's resolve to wipe out corruption and to ensure consumer safety. "Zheng Xiaoyu's grave irresponsibility in pharmaceutical safety inspection and failure to conscientiously carry out his duties seriously damaged the interests of the state and people," Xinhua cited the high court as stating. "The social impact has been utterly malign," the court said, adding that Zheng's confession and handing over of bribes were not enough to justify mercy. Yan Jiangying, spokeswoman for the State Food and Drug Administration, said the case had bought only shame to the watchdog. "This kind of serious case of law breaking by a small minority of corrupt elements, as far as the entire system is concerned, really made us feel ashamed," she said. "But these cases revealed several problems, and I think we need to seriously reflect on what lessons we can draw." "We should seriously reflect and learn lessons from these cases. We should step up our efforts to ensure food and drug safety, which is what we are doing now and what we will do in the future," Yan said about Zheng and a separate case involving Cao Wenzhuang, the administration's former pharmaceutical registration department director. Yan said the food and drug administration was working to tighten its safety procedures and create a more transparent operating environment. But the administration acknowledged that its supervision of food and drug safety is unsatisfactory and that it has been slow to tackle the problem, but vowed to improve. "As a developing country, China's current food and drug safety situation is not very satisfactory because supervision of food and drug safety started late. Its foundation is weak so the supervision of food and drug safety is not easy," it said in a statement at the start of the news conference. China has been under pressure domestically and internationally to improve its quality controls after a series of health scares attributed to substandard Chinese products, including exported tainted food and fake drugs. Zheng was sentenced to death in May for taking bribes to approve an antibiotic blamed for at least 10 deaths and other substandard medicines. Cao was given a death sentence last month with a two-year reprieve for accepting bribes and dereliction of duty. Zheng's death sentence was unusually heavy even for China, and likely indicates the leadership's determination to confront the country's dire product safety record. Under rules introduced at the start of this year, the supreme court also reviews and can quash death sentences, a power previously in the hands of provincial-level high courts. This time the supreme court spent little time endorsing the execution. The unusually harsh sentence and its prompt enforcement reflect the resolve of Beijing to fight against corruption and ensure consumer. Investigators found Zheng and his subordinates abused new rules in renewing drug production licences to squeeze kickbacks from companies. His misdeeds led to approval of many medicines that should have been blocked or taken from the market, including six fake drugs," Xinhua cited the court as saying. Last week, a court handed down a suspended death sentence on one of Zheng's subordinates on the same charges. Another senior administration official was jailed for 15 years in November for taking bribes and illegal gun possession. "The nest of corruption in the SFDA has done incalculable harm to the state and people," the Procuratorial Daily said. · Will Turkey invade northern Iraq?